Most people use a combination of bed bug sprays and bed bug powders to kill off bed bugs fast. Bed bugs are notoriously difficult to get rid of and finding the right spray to eliminate bed bugs is not always easy. Many natural residual bed bug sprays contain natural ingredients that have a proven repellent and insecticidal action against these infesting bugs. Some feel that they have to resort to commercial bed bug sprays to completely get rid of an infestation of bed bugs. Contrary to popular belief, having bed bugs in your home is not a sign of a dirty home. Bed bugs are commonly found in clean hotel rooms, on public transportation, and movie theaters. They can easily be brought into the home in luggage, backpacks, or by purchasing used furniture. They can also travel between apartments in large complexes. Although there are many ways to eliminate these tiny crawling bugs from your home, this article focuses on the best bed bug sprays to exterminate bed bugs effectively. You will also learn if natural bed bug insecticide sprays really work and what the precautions when using chemical bug sprays are. The best places to use bed bug sprays are in the tiny crevices around bed frames, in seams of mattresses, box springs, and headboards where bed bugs like to hide. The University of Kentucky says that unless the first signs of a bed bug infestation aren’t dealt with quickly, bed bugs can migrate to other rooms and infest those. To use sprays effectively to eliminate all traces of bed bugs, you need to know the signs of a bed bug infestation. The first sign that you may have bedbugs are some itchy bite marks on your skin when you wake up in the morning. Dr. Carol DerSarkissian on WebMD says that the bites from bed bugs cause red itchy bumps on the skin.3 You can learn about their other signs and symptoms in my articles on what do bed bug bites look like. Apart from spraying insecticidal liquid on bed bugs, other ways of getting rid of bed bugs for good include freezing items, using heat treatment, hot steam, and vacuuming. For more detailed information, read my article about the top 10 ways to get rid of bed bugs. There are many commercially produced natural and chemical bed bug sprays. It is important to be careful when using chemicals around the home in case they come into contact with children or pets. As with all sprays – chemical sprays and natural sprays – you need to spray the liquid directly on the bed bugs to kill them and repeat the application frequently. However, many of the best bed bug sprays have a residual effect and will continue to be toxic to the bed bugs for a certain time after spraying. Let’s look first at some effective bed bug sprays that you can make at home. There is also scientific research to back up the insecticidal effect of these sprays to use as part of your battle against bed bugs. One of the many uses of tea tree oil around the house is to use it as a DIY natural bed bug spray. Tea tree oil contains compounds that have an insecticidal effect against insects as well as their larvae and eggs. Although no direct studies have been published on the effect of tea tree oil on bed bugs, research has shown that it has a lethal effect on many bugs and insects. Put 20-30 drops tea tree oil in a small spray bottle, fill with water, and shake well. Liberally spray in all crevices in your bed frame and furniture where you think the bedbugs are. Repeat 2 times a day and continue using the spray until all signs of the bed bug infestation have gone. In a small spray bottle filled with water, add 10 drops peppermint oil, 10 drops clove oil, and 10 drops cinnamon oil. Spray in all joints, screw holes, and nooks and crannies where the bed bugs could be hiding. Also, treat mattress seams and other soft furnishings with the essential oil natural bed bug spray. Use 2 times a day and continue applying until you no longer see evidence of bed bugs. Remember to always shake the bottle well before use. Although some chemical bed bug sprays are effective at dealing with a bed bug infestation, their toxicity to humans and pets are an issue for many people. Great care has to be taken to avoid exposure that could be dangerous to humans, and some bug sprays manufacturers don’t recommend using the product if children are around. Harris bed bug killer is another popular chemical spray to eliminate bed bugs from your home. The manufacturers say that Harris Bed Bug Killer can be used on all soft fabrics to get rid of bed bugs as it won’t stain. You can also spray the solution in all nooks and crannies in your bed frame, furniture, and corners of your room to exterminate the bugs. It is also odorless. You can get more information about Harris bed bug killer and purchase it in Amazon here. According to a study carried out on Ortho Home Defense, it contains a chemical bifenthrin that is considered relatively safe and kills off bugs that pyrethroid-based insecticides can’t. It is also effective against bed bug eggs and larvae.12 It should be sprayed as a spot treatment in any crevice where bed bugs can reside. You can get more information about Ortho Home Defense bed bug spray and purchase it in Amazon here. At room temperature, bed bugs can survive for up to 3 months without feeding. So, even if no one is living in the room, bed bugs can still survive, especially if there is enough moisture in the air. However, to get rid of bed bugs effectively, you should not just rely on bed bug sprays for exterminating the pests, you should have an integrated pest control management program. This includes using various methods for bed bug removal. 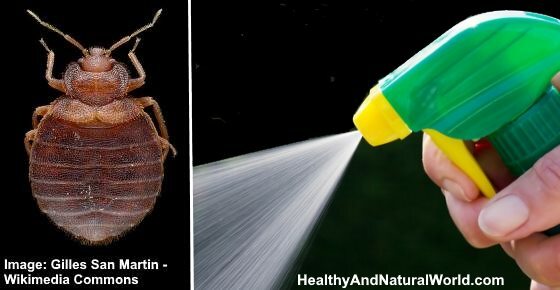 You can make a natural bed bug bite treatment by putting 1 cup distilled water in a spray bottle and adding 10-15 drops tea tree oil. Shake well and spray on areas of skin that have clusters of bed bug bites. Or, you could spray the remedy on a cotton pad and apply to the itchy bumps on your skin. You can also dilutes tea tree oil with a carrier oil, such as coconut oil or sweet almond oil (a few drops of tea tree per one tablespoon of carrier oil). For more ways to stop skin irritation caused by bed bug bites, please see my article on the top ways to get rid of bed bug bites naturally. EPA. Bed bugs appearance and life cycle. WebMD. Bed bugs: signs of an infestation. CityBugs. Bed bugs: do-it-yourself control options. BMC Dermatol. 2010 Aug 20;10:6. Insects. 2014 Dec; 5(4): 849–859. J Econ Entomol. 2014 Dec;107(6):2163-70. Insects. 2014 Dec; 5(4): 942–951. Sci Rep. 2014; 4: 3836. Med Sci Monit. 2006 Feb;12(2):BR57-62. NPIC. Bed bug biology and behavior. Great read and very helpful info. However, when you describe how to use essential oil sprays for bed bug treatment, it would be most helpful if you included the amount of water used to mix with the oils. Simply stating to use “a small spray bottle filled with water” isn’t a very good description. A quick search for “small spray bottle” will get results for a wide range from 2-ml to 16-ounce bottles, all classified as small. This makes for a rather potent mixture to an extremely weak mixture. Fair comment Rick. Using a 500 ml bottle (around 16-17 oz) will do the job.